We now consider 3-level models. We will use time-series data on 1721 students nested within 60 urban public primary schools. The outcome of interest is mathematics achievement. The data were collected at the end of first grade and annually thereafter up to sixth grade, but not all students have six observations. This dataset is used in Chapter 4 of the manual for HLM 6. It came in three files, one for each level, but I have merged them into a single file available in the course website. We read the data and fit a simple variance-components model. Note that we have two specifications for the random part, one at the school level (level 3), and one at the child-level (level 2). They are both null (intercept-only) models, so we are simply adding an error term at each level. We specify these going down the hierarchy. We also specify maximum likelihood estimation. (The R default is REML). Log likelihood =  -12652.99                     Prob > chi2       =          . We have 60 schools with an average of 120.5 students for a total of 1721 children, who have between 2 and 6 observations each for a total of 7230 observations. Our estimate of the mean score is -0.51 and the standard deviations are 0.56, 0.76 and 1.23 at the school, child and observation levels. We can turns these into intraclass correlations from first principles. 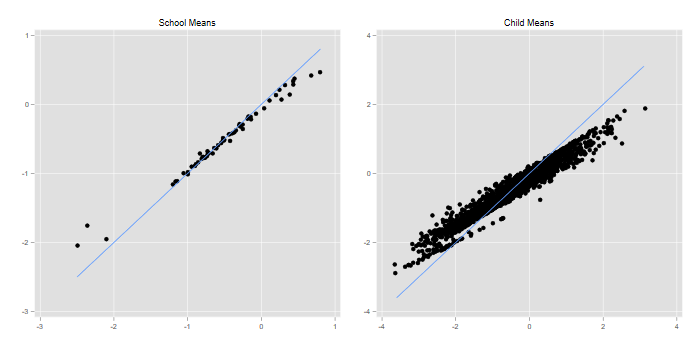 We find intra-class correlations of 0.13 at the school level and 0.37 at the child level. These numbers represent the correlation in math achievement between two children in the same school, and between two measurements on the same child (in the same school). We can also conclude that 13% of the variation in math achievement can be attributed to the schools and 37% to the children (which includes the school).
. egen n2 = count(math), by(childid) //? We see the usual shrinkage, particularly for the child means. We will follow the HLM manual in using years to track progress in math achievement over time. Year zero is near the start of the third grade, and I will refer to it as ‘third grade’ for simplicity. Our first model will allow for random intercepts and slopes, with no predictors at levels 2 or 3. I specify covariance(unstructured) at each level, so the intercept and slope can be correlated at level 2 as well as level 3. The first thing you will notice is that as models become more complex they take a bit longer to run. The results can be compared with the output from HLM 6 starting on page 80 of the manual, and are in very close agreement. The fixed-effect estimates yield an intercept of -0.78 and a slope of 0.76. These values can be interpreted as the average achievement in third grade, and the average rate of change per year. Clearly average math achievement increases significantly over time. The output also shows the variances and covariances of the random effects. The correlations can be obtained with estat recovariance, which has an option corr. We see that the intercepts and slopes have correlations of 0.40 at the school level and 0.55 at the child level. 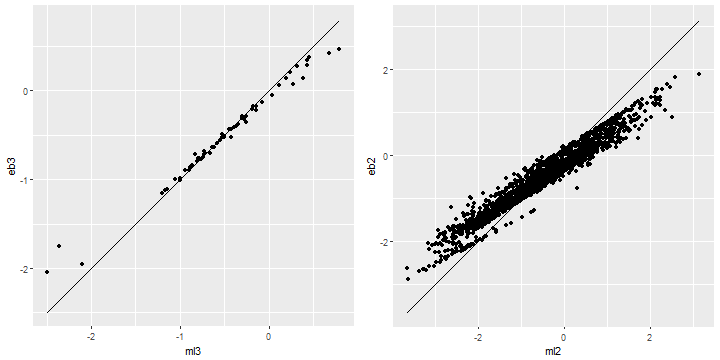 (In a hierarchical model the correlation at level 2 is never lower than at level 3.) The child estimate (0.55) can be interpreted as the correlation between a child’s achievement around third grade and her rate of growth. The school estimate (0.40) represents the correlation between a school’s achievement around third grade and the rate of change per year. Most of the variance in the intercept comes from the child level, whereas the variance in the slope is about the same at each level. These results indicate fairly significant variation among schools in mean achievement around third grade, as well as in the rates of change over time. 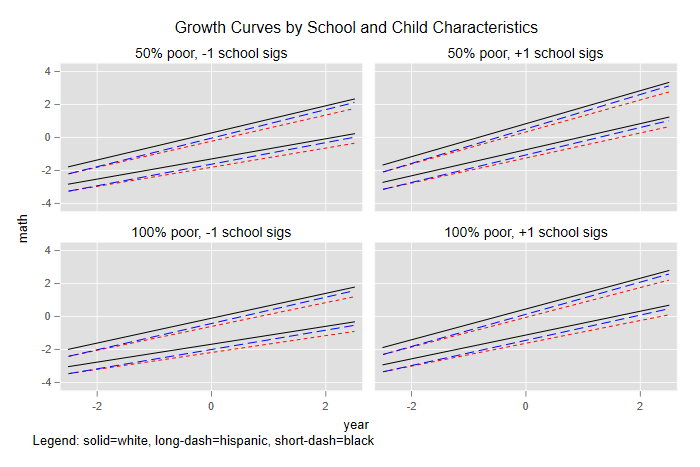 We can now estimate growth curves for each school and for each child, combining the estimated fixed and random effects. 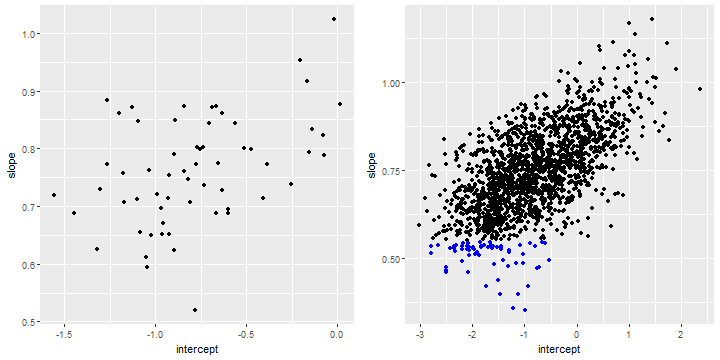 I’ll just predict the random effects, and plot the slope versus the intercept at each level. Note that at the child level I include both the school and child residuals. In Stata we use predict with the reffects option. With four random effects we need four variables to store the Bayes estimates. I’ll use numbers for the levels, a for intercepts and b` for slopes. We see substantial variation in school levels and rates of change in math achievement. One school is notable for having a reasonable third-grade mean, but a low rate of change per year (just above 0.5). I highlight the children from this school in the graph on the right, which shows their expected third-grade scores and rates of change combining school and child effects. Note the positive correlation between intercepts and slopes at both levels, so children and schools with higher third-grade math achievement also tend to show greater gains over time. We can also plot fitted lines at the school and child level. It might not be a bad idea to test for linearity of the growth curves. One way to look for school or individual characteristics that may be associated with levels and trends in mathematics achievement is to plot or regress the Bayes estimates of intercepts and slopes on potential predictors at each level. Here I’ll follow the HLM manual in considering a model where a child’s growth curve depends on ethnicity, with different intercepts and slopes for whites, blacks and hispanics, and where the school average curve depends on the percent of students with low income. One way to develop a model of this type is to write down the equation for each level and then substitute down the hierarchy to obtain the fixed and random components in the complete model. This process shows the need to create cross-level interactions between year and the predictors at the school and child level. Before creating cross-products we consider centering. This is not needed (not, in my view, advisable) for dummy variables, where zero is meaningful because it identifies the reference category. One might consider centering the percent poor, but for consistency with the HLM manual I will not. Bear in mind that the main effects then refer to a school with no poor students! Results can be compared with the HLM output starting on page 88 of the manual. In this model each child has her own growth curve, but the intercept and slope depend on the school’s percent poor, school unobserved characteristics, the child’s owh ethnicity, and unobserved characteristics of the child. One way to think about the estimates is as follows. We start with a growth curve that has 0.141 points of math achievement by the middle of third grade and increases by 0.875 points per year, provided the school has no poor students. Each percentage point of low income students is associated with a third grade mean that’s 0.008 lower and increases 0.001 points less per year, so a school with 100% poor students would have a third-grade mean of -0.617 and an increase of 0.738 points per year. The intercept and slope in any particular school will vary around the average line for its percent poor. Next come characteristics of the individual, in this case ethnicity. Blacks have a third-grade mean 0.502 points below whites in the same school, and the increase per year is 0.031 points less than for whites in the same school. The results for hispanics indicate a third-grade mean 0.319 points below whites, but a growth rate per year 0.043 points higher than whites in the same school. Each child’s growth curve, however, will vary around the average line for kids of the same ethnicity in the same school. The random effects indicate that the average third-grade score varies by school, with a standard deviation of 0.28, while the rate of change has a standard deviation of 0.089. 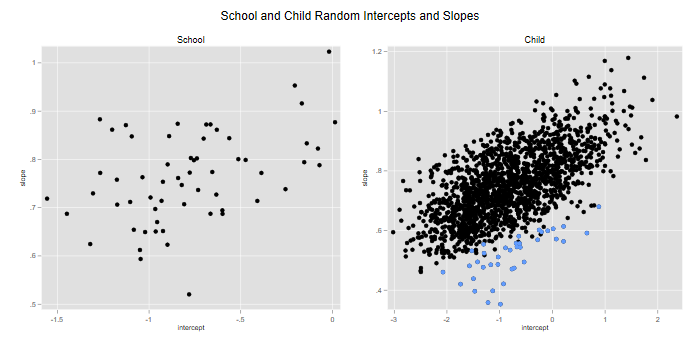 Interestingly, the correlation between intercept and slope has practically vanished, suggesting that it can be attributed to the school’s socio-economic composition. 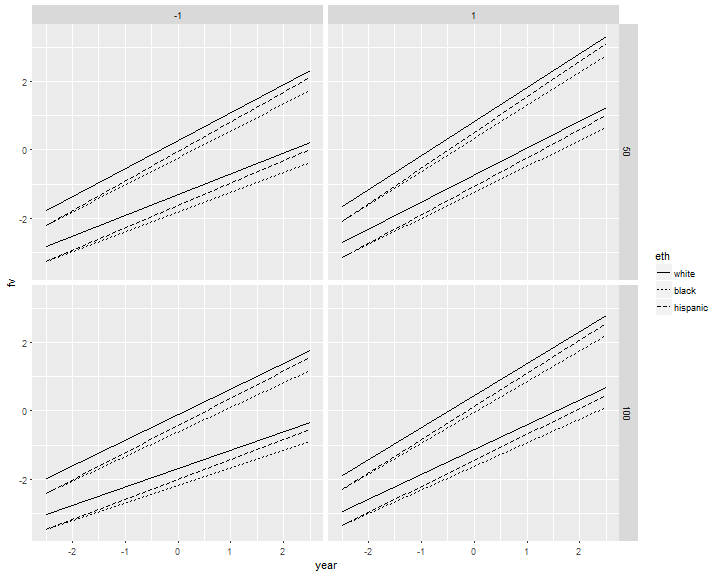 Variation at the child level is even more sustantial; expected third-grade scores vary with a standard deviation of 0.789, and the rates of change vary with a standard deviation of 0.105. These two random effects remain highly correlated, so kids who have high levels of math proficiency in third grade also tend to improve faster over time. It’s useful to compare fixed and random effects on a similar scale. Here I will consider four types of schools, with 50 and 100 poor and random effects one standard deviation above and below the mean. In each school I will consider kids from the three ethnic groups whose intercepts and slopes fall one standard deviation above and below the mean of their ethnic group in their school. To do this we need to create a prediction dataset with the combinations of interest. I will store these in the first few rows of the dataset. We can then predict the fixed effects and add the random effects. In Stata we first expand the dataset.
. label define schoolz -1 "-1 school sigs" 1 "+1 school sigs"
. label define lowinc 50 "50% poor" 100 "100% poor"
The plot shows the relative importance of fixed and random effects at the school and individual levels. At the school level the difference between 50% and 100% poor is smaller than the two-sigma difference in unobserved school characteristics. At the individual level the differences between whites, blacks and hispanics are dwarfed by the two-sigma differences in unobserved child characteristics. Interestingly, within each school type the average line for hispanics starts at about the average level of blacks in first grade, but catches up with the average level of whites by sixth grade.